We believe that investing in Niwot High School positively impacts our students and our community. Investing in Niwot High School positively impacts our students and community. 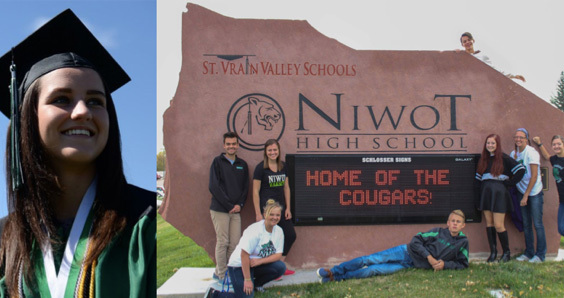 The Niwot High School Education Foundation engages and inspires the community to support students, award-winning teaching and learning experience at Niwot High School. We promote the welfare of students, teachers and staff members by providing financial support for the programs that enhance and enrich student learning. Niwot High School Education Foundation is a 100% volunteer foundation created in 1994 with the sole purpose of augmenting the school's annual budget to enrich the educational experience at NHS. Since our modest start, the community's generous support of the Foundation has allowed its impact to grow dramatically. In our first year, the Foundation grants were under $100. Over the past five years, the Foundation grants averaged $25,000 per year to Niwot High School, with additional funding for major projects. Today, the NHSEF Board of Directors is comprised of parents, community members, teacher and staff representatives, members of the student council and the NHS principal. The NHSEF funds educational opportunity and success. As a volunteer organization, all funds received are used for grants, scholarships and major projects. Donations are tax-deductible to the extent allowed by law. NHSEF is a Federal 501(c)3 Colorado non-profit corporation.